I can confirm that my B525s-65a (as supplied by Eternal Comms) definitely has the Bridge Mode option (under the Settings > Security menu if I recall correctly - but it's definitely there, haven't tested it yet). As for the RJ11, I too am interested in this. I haven't tried yet - waiting for my Three AYCE SIM to arrive next week before I can have a real play around - but I'm searching the web for info on this. I did find this answered question on Amazon, which is a bit confusing because Huawei say one thing ("no" - indicating in my mind they intend it for VOIP), and a customer (the top answer of 2 on that page) says "yes" (quote: "This seems to be a WRONG ANSWER from the manufacturer") - here's the link anyway: Amazon Q&A on Huawei B525 RJ11. I will experiment further with the RJ11 connection & a phone once my Three SIM is installed, will report back next week. If it where me I would use a MikroTik RouterBoard SXT LTE powered using passive 24V PoE from an Edgerouter X SFP or if you prefer to go all MikroTik then a MikroTik RouterBoard hEX PoE. There are then a range of Ubiquiti and MikroTik WiFi access points that can be powered using 24V passive PoE from either the Edgerouter X SFP or the hEX PoE. Personally I think the Ubiquiti access points are better, but they do cost more. When you get your VDSL then just add in a VDSL modem to the configuration. For extra bonus points the following device will allow you to power a Huawei EchoLife HG612, Draytek Vigor 130 or Netgear DM200 VDSL modem from the router, so you only need some Cat5e to where ever it's located. 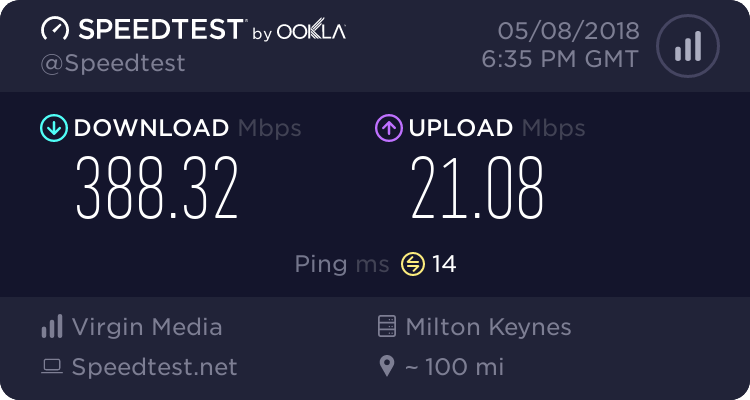 I've seen other solutions too (some involving Raspberry Pis & Linux), but haven't yet delved into them as yet, as I'm keeping my ADSL2+ connection alongside the 4G - for now at least. The extra cost of paying for the VPN halves the savings, so I will probably leave it for now, but it does give me a bargaining point when I come around to renewing my contract with VM - we don't need the 350 down, but it's the only way to get a decent upload with them. My VDSL speeds were not great, was getting around 47/6Mbps. I also expect in time when the mobile carriers start using IPV 6 these issues will go away. I think you are right. My EE iPhone seems to route IPv6 but CGNAT IPv4 - but I haven't tested if there is any inbound port filtering (firewalling) on IPv6 as my home broadband isn't 6 enabled. I have no experience of IPv6, so will be something else to get my head around. If I go to https://test-ipv6.com/ on my phone I score 10/10, although it says my browser (chrome) is avoiding using IPv6 and that I'm using a proxy, it also says my ISP is Google, it's not its Three. Then at a guess, try another browser. Chrome is doing some proxying! So with Chrome, Google is proxying your connection so you can access IPv6 sites even when either your phone, your network or both isn't currently able to. Do you know if the MikroTik is compatible with all current '3' bands? Looks a nice bit of kit for the money as if I used one of these it would be on the front of the house so not as ugly as most antennas.